Description of "Spiderman aur Rinku"
This is a poem book. 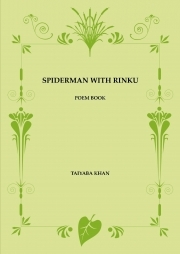 Spiderman aur Rinku both are the main character of this poem book. whenever, Rinku finds trouble he calls spiderman.Spiderman helps Rinku in everywhere. My name is Taiba. This is my first poetry book. This is my aim to become a nice writer. Reviews of "Spiderman aur Rinku"